Found feeding in developing seeds of Desert Broom (Baccharis sarathroides) in the Four Peaks area, Maricopa Co., Arizona, USA, 16 Nov. 2008. 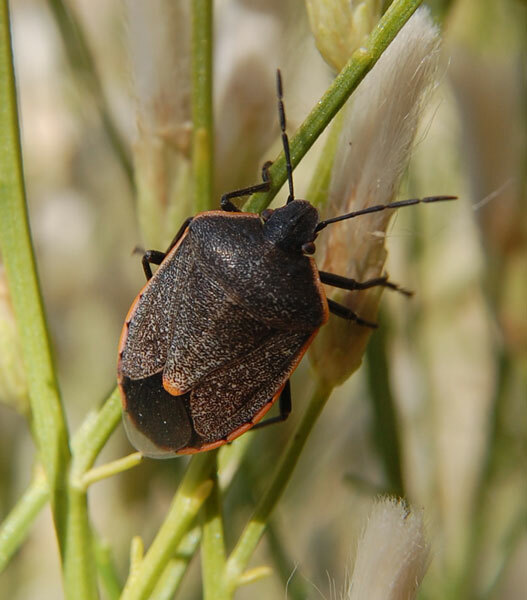 Stink bugs tend to focus their feeding activity on developing seeds, fruits or buds where food is more concentrated and where the protein content is higher. The Conchuela Bug is fairly common by late summer and fall in the Sonoran Desert particularly on plants that are flowering or setting seed. They extract developing seed contents through their piercing-sucking mouthparts. The feeding may damage the developing seed inhibiting future germination. From California to Texas and Mexico this insect is occasionally common to abundant in cultivated cotton and other crops where it can result in some economic yield reduction. Beyond the ability of the human ear these insects communicate with each other through minute vibrations. The vibrations are produced by the bugs tapping against the plant surface. These vibrations are conducted through the plant substrate as songs of courtship and rivalry (Bagwell et al., 2008, Ann. Ent. Soc. America).